As someone who lived under Communism for most of my life, I feel obliged to say that the biggest threat to freedom, democracy, the market economy and prosperity at the beginning of the 21st Century, is not Communism or its various softer versions. It was replaced by the threat of ambitious environmentalism. He refutes global warming hysteria, not so much from a scientific approach – which he admits is beyond his field of expertise – but rather from the standpoint of an accomplished economist and politician. While this may sound odd at first glance, it makes for a fascinating and utterly convincing read. That is not to say that the book is void of all scientific data. President Klaus has included many references to accepted scientific studies to make his points. Thus, he is able to show that, despite all the fuss over global warming, average world-wide temperatures rose a mere 1.1 degree Fahrenheit in the entire Twentieth Century. Similarly, he quotes statistician Bjørn Lomborg, to show that if the Kyoto Protocol were strictly enacted throughout the whole world, it would only slow the rise of global temperature by five years over the next hundred. Thus, mankind would experience the same temperatures in 2105 that he would have experienced in 2100 if none of the protocol’s provisions were even considered. However, the book’s scientific content is not its strong point. Certainly, hundreds of books exist that debunk exaggerated theories on global warming in a more thorough and professional manner. 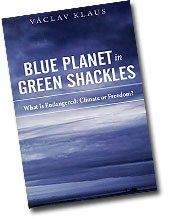 The unique value of Blue Planet in Green Shackles is its analysis of the issue from a fresh new perspective. While many may find it difficult to believe that any correlation exists between global warming, and economic and political theory, a summary of some of the book’s argumentation should demonstrate how intimately the two are connected. For example, President Klaus concludes that the environmental movement is currently led more by ideology than true science. He affirms that environmentalism has become a quasi-religion that aims at destroying society as it is currently known. That environmentalism is an ideology divorced from data and scientific fact is also evidenced by the ecologists’ campaign against affluence. They disregard the fact that only after a country has surplus funds and citizens living with a large degree of economic security, can it begin to give attention to less imminent concerns like the environment. Such concerns increase together with the nation’s wealth. Thus, if environmentalists were moved by fact, rather than prejudiced against wealth and developed societies, one of their greatest methods of action would be to promote development and stimulate rather than suffocate economic growth. Another of President Klaus’ observations shows that when predicting future crises, environmentalists ignore technological advancement, which continually develops more efficient and cleaner ways to produce energy and provide for society’s needs. By ignoring this fact, they are able to predict seemingly catastrophic risks that have no basis in reality. For example, as agricultural methods improved, fewer farmers on smaller lands could feed more people. Common sense shows that any scientist or statistician, wanting to predict the amount of resources that will be necessary one hundred years from now to feed the world’s population, must suppose that one hundred years from now there will be better methods of farming than those that exist today, otherwise his predictions will be gravely inaccurate. Modern ecological scaremongers refuse to consider these inevitable advancements in technology. Thus, they base their predictions on false future models. Another means ecologists use is to exaggerate the so-called “precautionary principle,” according to which, any measure is advisable, regardless of costs, due to the catastrophic risks that are involved. In other words, they intimate that even if their predictions are exaggerated – or just plain wrong – their proposals should be accepted because of the consequences the world will suffer if they are correct. This thinking is fundamentally flawed, because dire measures alone often produce dire consequences. A perfect example of an exaggeration of the “precautionary principle” is the Kyoto Protocol. There is simply no proportion between the supposed risks it safeguards against and the costs it’s application would require. First of all, there are no definitive studies showing that man’s behavior is a significant factor in global temperature increase, or even that this warming is a matter for concern. For example, while estimates claim that higher summer temperatures could result in the deaths of an additional 2,000 people in Great Britain over the next fifty years, the same estimates predict that 20,000 cold-related deaths during winter could be avoided by the same increase in temperatures. Furthermore, as mentioned above, the best-case scenario for the Kyoto Protocol would only push back climate change five years over the next one hundred. To eliminate these so-called “risks,” the protocol suggests implementing measures whose costs would be astronomical. The restrictions it demands would have a crippling effect on economies worldwide, but especially on poorer nations. Worse yet, some scientists are suggesting that the Kyoto Protocol does not go far enough and insist that we must eliminate 60%-80% of all greenhouse gas emissions. Another example of exaggeration of the “precautionary principle” is the stir about nuclear power. Although, nuclear power has proved to be one of the most, if not the most, safe and reliable sources of power, environmentalist regulations has greatly stifled their production and tried to close those already in existence. To understand the cost of replacing nuclear power, it helps to consider that the Czech Republic’s nuclear power plant in Tremlín alone produces the same power as 4,750 windmills. The construction of these windmills would consume 8.6 million tons of material and, if placed in a line as close together as possible, would stretch 665 kilometers. This line would be 150 meters tall and reach from the current Tremlín plant to Brussels in Belgium! That does not even consider the 20-30 thousand birds that would be killed annually in the windmill’s propellers. Is the cost of closing these plants proportional to the supposed risks of nuclear power? Furthermore, securitarian thinking often leads one to jump to conclusions and miss the bigger picture. This can cause greater problems than the original difficulty one hoped to avert. For example: an estimated 20 people in the US die each year from cancer related to pesticide use. Following the exaggerated precautionary principle, one might be tempted to ban pesticides without considering that this would lead to a 10%-15% rise in vegetable costs. This price hike would limit the amount of cancer-fighting vegetables American’s consume to such an extent that it would cause an annual increase of 26,000 cancer-related deaths. The incontrovertible facts and fresh approach contained in Blue Planet in Green Shackles make it a must read for anyone fed up with environmentalist propaganda and scaremongering. It is rich with argumentation and an excellent resource, though some of the economic argumentation may be hard for a layman to follow. It is also secular in its approach and favors theories on evolution and overpopulation that will not sit well with Catholic readers. Furthermore, President Klaus is an unabashed follower of Ludwig Von Mises and in particular his very secular work Human Action, which he calls “the greatest book Von Mises ever wrote.” However, this work, particularly chapter 8, is incompatible with Catholic teaching. Nevertheless, Blue Planet in Green Shackles is full of solid argumentation against the rise of “enviro-dictatorships” that threaten modern society. It is an effective tool against the environmental pseudo-religion of the Twenty-First Century that strives to build a society that would be the antithesis of true Christian civilization. This entry was posted in Fighting for our Culture and tagged TFP Recommends Books by Michael Whitcraft. Bookmark the permalink.